Error input file format. Please try again. But the input file is legitimate; I can view it in any old pdf viewer. Time to time I have to merge PDF pages (pages 2-3 to one double sized page etc.). I have always done that by printing multiple pages per sheet... in my case 2 pages per sheet, but instead of printing, I have saved my work as PDF. Now I have upgraded to MacOS X 10.6 and that doesn't work any more. If I try, I get warning "Saving a PDF file when printing is not supported, use File>Save instead". you may use full path for both input and output filenames to try again, we hope the full path will work fine to you. 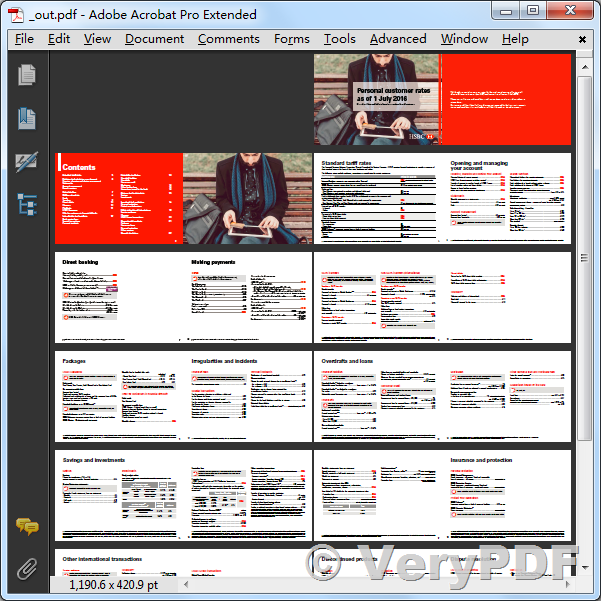 C:\>"C:\Program Files (x86)\VeryPDF PDF Stitch v2.1\pdfstitch.exe"
Copyright (C) 2005-2013 VeryPDF.com, Inc.
VeryPDF PDF Stitch can help you stitch multiple PDF pages onto a sheet. You can specify how the pages are ordered, either in vertical columns or horizontally across the sheet. refers to the plan file type: "lua" or "legacy". <path> refers to the path of the selected plan file. -rt <int> : Rotate the input PDF pages. (0, 90, 180, or 270.
per sheet: 2 pages a row and 4 pages a column. -addline <int,int,int> : Add lines. <int,int,int> refer to the RGB values. -gx <int unit> : Specify the width of each vertical gutter. Unit is in, mm, or pt. -gy <int unit> : Specify the height of each horizontal gutter. -t <int unit> : Define the top margin for each output sheet. -l <int unit> : Define the left side margin for each output sheet. -r <int unit> : Define the right side margin for each output sheet. -b <int unit> : Define the bottom margin for each output sheet. letter. Cannot be used with -scale. e.g., -scale 100 is to retain the original size. How to print many PDF pages in one using letter format? This entry was posted in PDF Stitcher and tagged pdf stitch, pdf stitcher, stitch multiple PDF, stitch PDF, stitch PDF pages. Bookmark the permalink.